We have never gone on a food tour before, but when in Rome, I think that it is something that is not to be missed. So when our old Mongol Rally teammate Sherry of Ottsworld hooked us up with Kenny of Eating Italy Food Tours in Rome, how could we resist? We awoke to a beautiful morning with the sun shining as we walked from Trastevere to Testaccio. 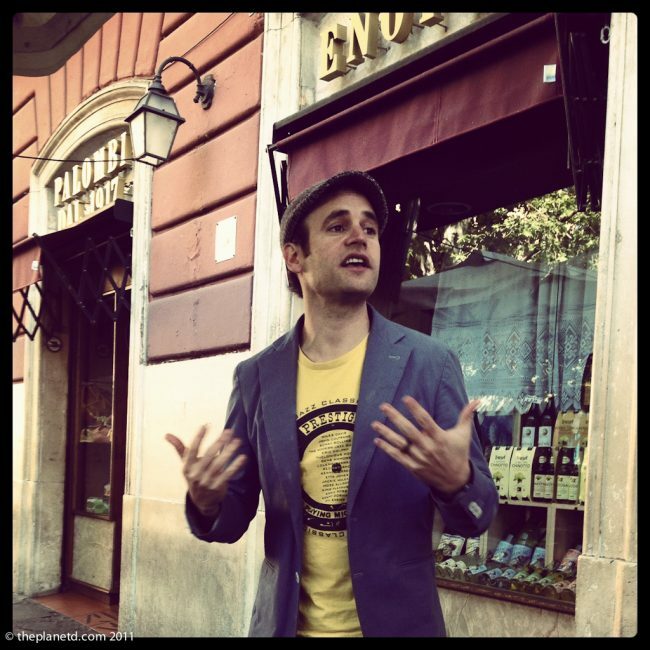 We were surprised to see just how popular this tour was, 11 other people were joining us on our culinary and cultural journey through one of the last remaining “old” neighbourhoods in Rome. We definitely got a feel for the real Rome here. Are you heading to Rome this Year? Our day started off at a traditional 98-year-old food market where we met some colourful characters whose stalls have been passed down through generations. There were Enzo and Lina, a couple who've been married for 40 years and working together in a tiny stall serving the creamiest water buffalo mozzarella cheese I have ever tasted. 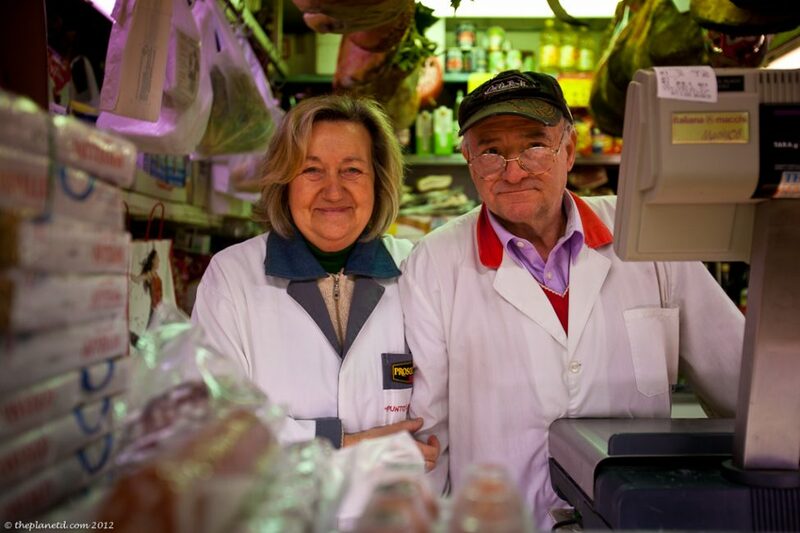 For 30 years they have run this market stall with very high standards, Enzo is the prosciutto man and Lina is the cheese expert, together they make magic. Next stop was the tomato stand owned by Carmelo .”The Tomato Poet” has been written up in Magazines all over the world for his expertise. When you buy tomatoes from Carmelo, you don't tell him which tomatoes you need, you tell him what you are cooking and let him decide. He is a tomato genius! It was then off to explore more of the neighbourhood and taste more food. 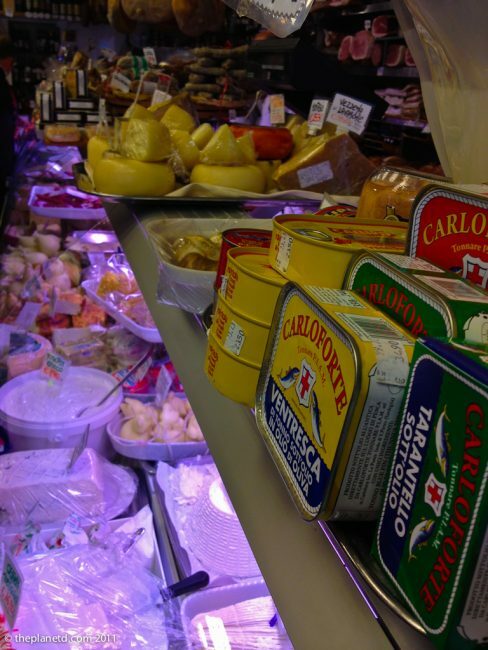 One of the first shops of it's kind, E. Volpetti sells cheese and cured meats to die for. We sampled a large chunk of pecorino cheese with Black Truffle, plus delicious melt in your mouth prosciutto as well as some delicious Barolo salami. The sampling didn't stop there. We tried some 15-year-old balsamic vinegar that was surprisingly sweet, yet smooth. I can only imagine what the aged 100-year-old vinegar tastes like. I won't tell you what it sells for because it's a surprise. 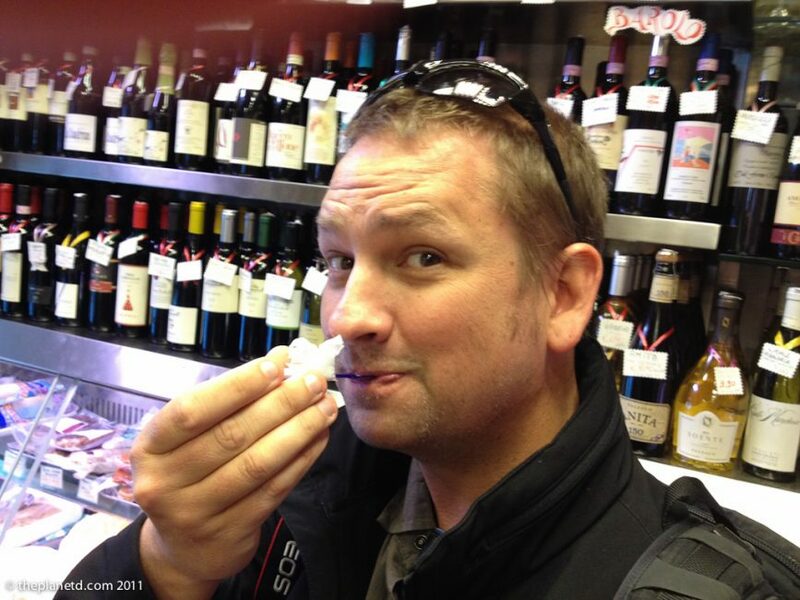 You'll just have to take one of your own Rome Food tours with Kenny to discover it for yourself! It had been a lot of salty and savoury foods thus far, so Kenny made sure to take a moment to enjoy some sweets. We tried the typical Roman breakfast, a cornetti. It's is like a croissant but oh so much better. 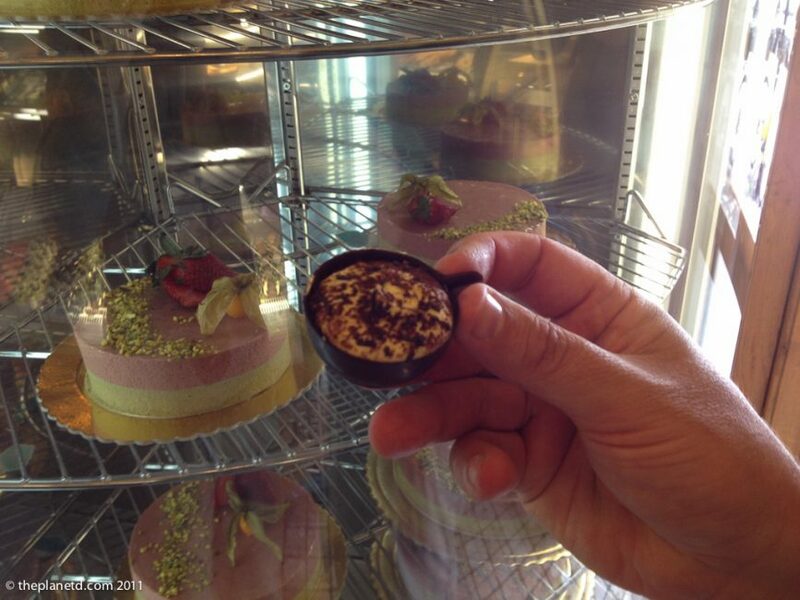 As if this wasn't decadent enough, we had some tiramisu in a chocolate cup. Barberini was voted the best tiramisu in Rome and I can understand why! Kenny had great stories about every location that we visited and about the area of Testaccio, his home of the last 4 years. His wife was transferred to Rome and he started this business only last June. 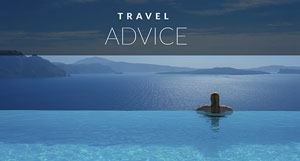 It has grown immensely being named #5 as the top things to do when visiting Rome on Trip Advisor. We can understand why. It is the perfect blend of food, culture, history and humour. One thing we loved about the tour was the diversity. 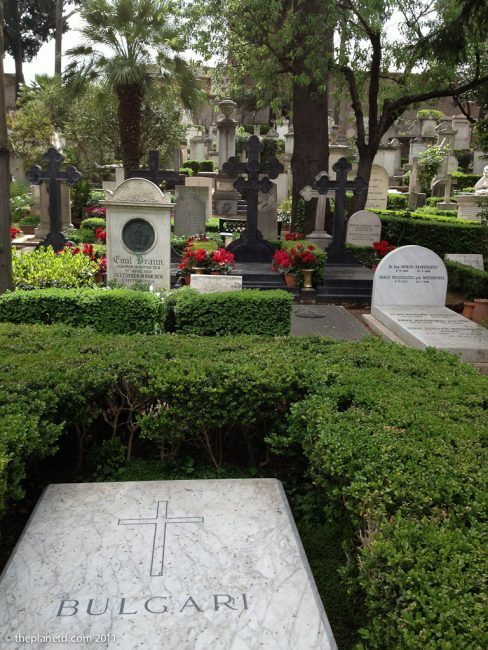 We stopped at Rome's most famous cemetery, the Non-Catholic Cemetery for Foreigners. 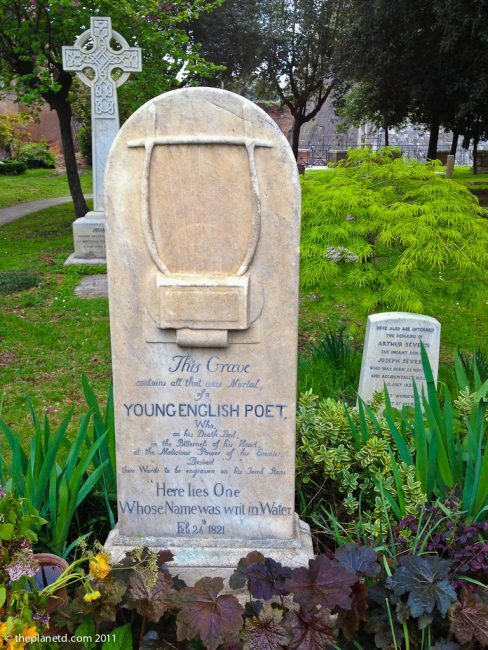 With famous residents such as Keats, Shelly and Bulgari it's website claims that it quite possibly has the highest density of famous and important graves anywhere in the world. We just found it to be exquisite. We wrote a separate post about it, but I could have spent the afternoon perusing it's tenants and photographing its grounds. It was now time for the main meal of the day. We had a tasting of three different types of pasta served with wine of course. This was in one of the most unique restaurants on the planet. Built inside the artificial mountain of clay pots stacked perfectly upon one another by the ancient Roman's this is a place that is not to be missed! What is this artificial mountain we speak of? At 35 metres high (100 feet) it is the largest pile of junk in the world. But like all things Roman, this pile of junk is a work of art. Leftover pots containing olive oil were broken down and stacked upon one another to create a giant mountain in the middle of the city. Since it's core temperature was noticed to be between 40-50 degrees Fahrenheit, (5-10? Celcius) people decided that it would make for a perfect place to store wine. Long story short, the wine cellars of the past, have been turned into Trattorias and Osterias of today! Italian's Eat A Lot and This Tour Makes Sure You Do Too! Feeling thoroughly satisfied, we were shocked to hear that we still had two more tastings before the end of our tour. Luckily, we had a little walk before our next meal and were ready for the mouth-watering “Suppli ala Genovese” at 00100 Pizza. Who would have thought that boiled rice blended with slow roasted beef and onions, mixed with romano cheese, rolled in breadcrumbs and deep-fried could taste so good! 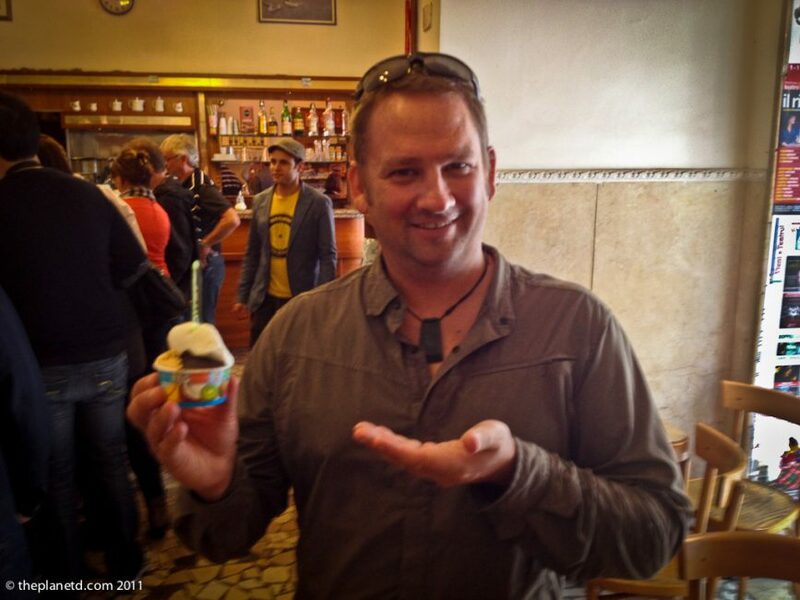 We saved just enough room for the best Gelato in Rome where Kenny gave us a lesson on how to spot true Gelato and avoid the imposters found at so many tourist spots. There are a lot of points to remember and it is an elite club to be a part of to know the difference. We received our certificates of graduation from Gelato school after this tour so I can't give away all the secrets. If the mint gelato is green, it's an imposter. Mint should be white. There you have it, you too can now pick out the impostors from the true Gelaterias. And our day came to an end. 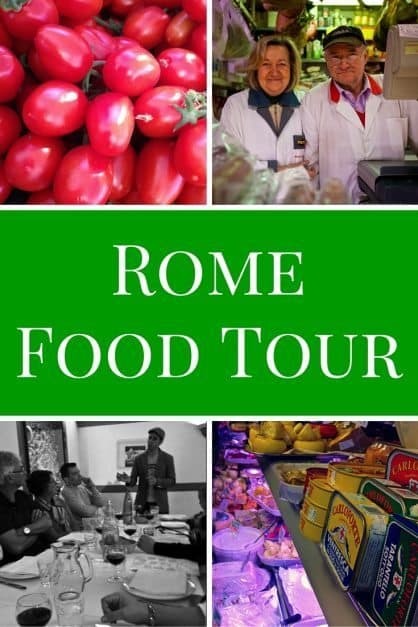 We loved our food tour of Rome with Eating Italy Food Tours. Kenny has a passion for all things Roman, especially the food and it shines through. If you visit Rome, be sure to go on a food tour to understand the Roman culture and its food. 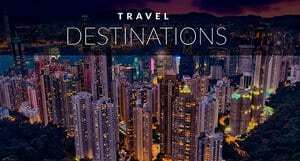 For more information on booking your own Food Tour, check out Eating Italy Food Tours website: Rome Tours. It was one of the best days we've ever had in a city during our travels. At 59€ for all food and wine with pasta. Great stories and company it's a steal too! We can't say enough about it, and we're not even foodies. 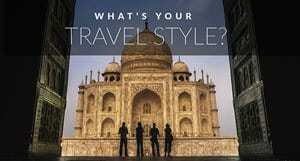 Kenny just may have inspired ThePlanetD.com to change from Adventure Travel Blog to Dining Travel Blog. Mmm, I like the sounds of that, ThePlanetD, your place for delectable and decadent meals. 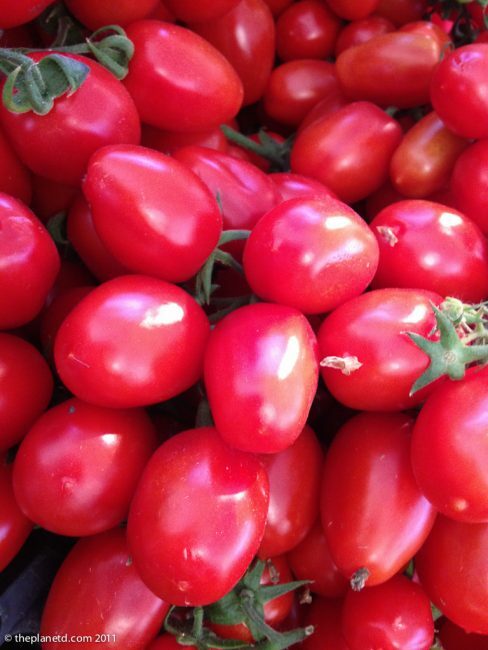 30 Responses to "Rome Food Tour – with Eating Italy’s Testaccio Tour"
The food are all very delicious. I wish I can go to Rome. 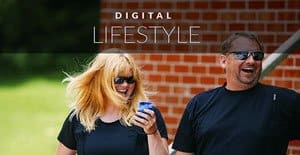 Thank you for posting this article of yours!! I really want to go to Rome but I think I don’t have the money and the luxury of going there. Thank you for posting this because if weren’t for you, I would never had a taste of what country I want to visit. I hope that you manage to get there one day. There are ways to see Rome on a budget. The apartment we stayed in in Trastevere was less than $100 per night. Not bad for downtown in a major city. I will put out good vibes for you that one day you will fulfill your dream. Hi Dave. How many pounds did you put on? Everything looks likes you can’t stop at one sampling. Nearest thing I’ve done to a food tour is over at Disney . Kenny the guide looks like a real Italian with the hand motions. Totally excited about the food in Italy! Scared to think about how much weight I will be gaining. 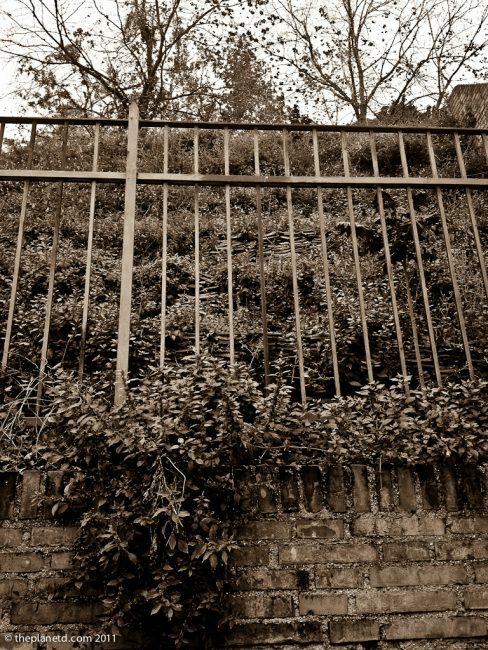 This post and photos bring back so many immediate memories of my wanders through Trastevere and Rome. I stopped at many little grocery shops for fuel and received the usual gruff welcome “Dica” – speak. I spoke no Italian so with help just piled up a carryable pile of treats that would last me until my next stop. Gruffness yet kindness and care for a young foreign woman wandering on her own, speaking not a word of the language. Honestly, I’m tearing up at the memory. Lovely, lovely post … thanks for that. Lesley, it sounds like you had a wonderful time! Rome brings out a lot of emotion doesn’t it. Trastevere is such a great neibourhood as well. Great tour across Rome! You have become a Gelato expert! but nobody can beat the Pizza tour, it would be my favorite! You just wrapped up beautifully how wonderful that tour was. 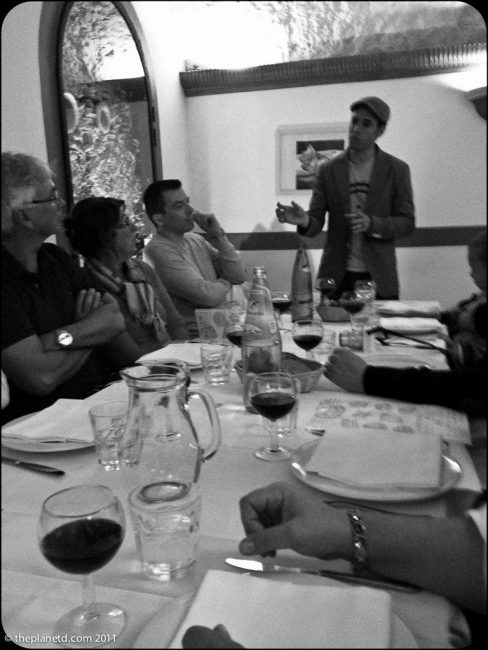 Kenny’s passion for the subject is communicative, we see that he is genuinly happy to share is knowledge about real italian food. We could have listened him for hours. Jacques will always remember is 40th birthday since it was his gift from me and Augustin (the whole trip not just the tour). I will never be able to eat gelato again unless it is of the same quality we had on the tour! Thanks for your blog, Jacques found it out searching on the web, knowing you would post something about the tour. I hope you enjoy the rest of the trip, for us it’s back to work! If ever you want to sample some Belgium delicacies (french fries, mussels, chocolate, etc…) do not hesitate to contact us! We will be pleased to hear from you! Sounds awesome. I would have loved to take this tour. I absolutely loved the prosciutto in Italy. Thankfully there’s a great cheese shop right by my apartment in DC but naturally it’s nowhere near as good as the real thing! Wow ”The Tomato Poet” Now he would be a handy chap to have at the local supermarket ! I’d love to go to Rome just for the food, but I’m sure there are a lot of other things I’d want to see too. 😉 My mouth is watering now. How much fun and you did it in one of the best places in the world for food! I had no idea this was your first food tour…well, it’s about time! However, now I’ve ruined you…this is one of the best I’ve been on. Glad you guys enjoyed it – it’s a ton of food and info. 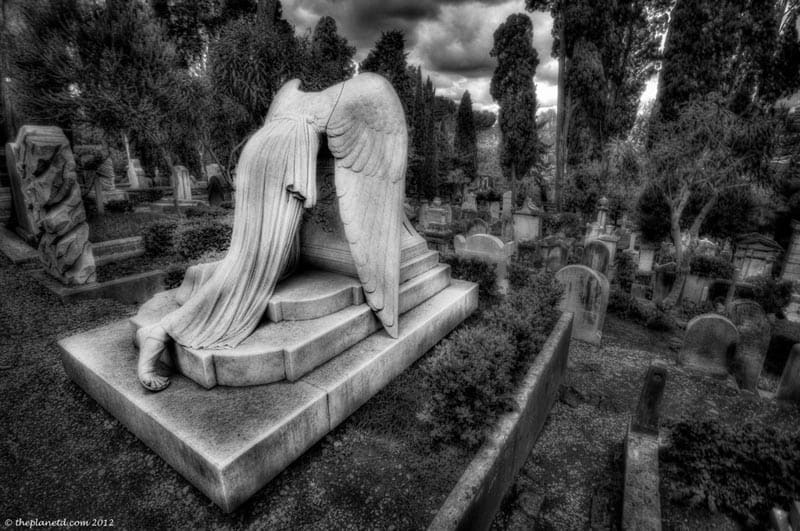 Yes – the cemetery was one place I could have stayed for hours. Have a great time in Rome guys! Appreciate the tips for picking up the real gelato flavors. Wow sounds amazing. It’s making me realize how painfully inadequate my local italian restaurants are at recreating true italian food.